I imagine myself as a painter. An abstract painter. 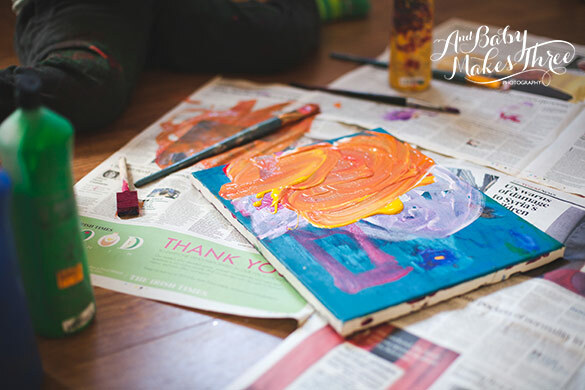 Creating large colourful canvasses that bring joy & happiness into peoples’ lives. I can envisage what these canvasses look like. I can imagine the emotions that people will feel when they look at those paintings. I can feel the happiness that they bring to the people who happen upon them and make a connection with them. The only thing that I can’t do though is actually paint them! Every time I go to paint, I am crippled by my expectations, my strong ideas of what the final result should look like and I am unable to let myself go. To just let myself go and enjoy the process and not get too hung up on the end result. I just can’t seem to get over that hurdle. When I do actually manage to create something, it never lives up to my expectations and therefore I’m not happy with it because of my attachment to what I want the outcome to be. This is where we can learn from our children. 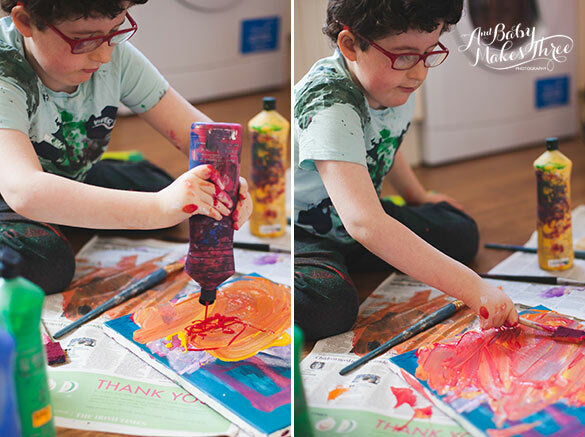 I love watching my little boy Oisín paint. 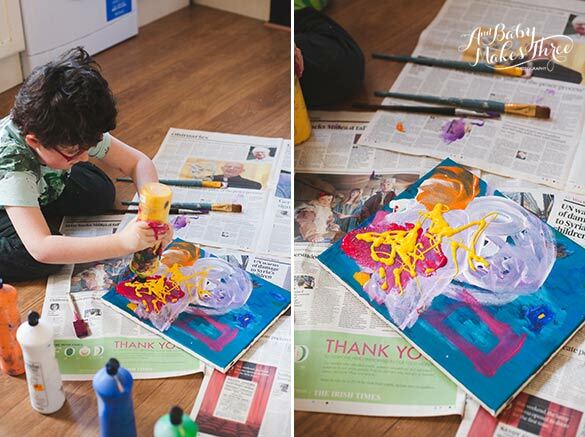 He just throws himself into it and he is so in the moment when he paints – it’s a joy to behold. He doesn’t go in there with an idea of what he wants to create. He just starts to create and his painting evolves. It’s a terrible thing to admit but I think I might be jealous of my 6 year old little boy! Is that really bad??? I’m jealous of the way he can just let himself go and completely detach himself. I hear myself say to myself “I want to paint like that!”, in a whiney little girl’s voice. Or else, I find myself wanting to say to him “Stop! It’s perfect now! Don’t go any further” as I think to myself I could scan that and print it on a large canvas and hang it on the wall. He paints the way I want to paint – his loose brushstrokes heavy with thick luscious colourful paint drifting across his canvas to create some abstract form that is coming from within him. He’s not trying to copy anything or emulate something he’s seen before. He’s just being himself expressing himself in the only way he knows. Of course I never (or will ever) tell him to stop (just in case you were worried!). I let him keep painting and it quite often turns into a muddy kind of mush but he doesn’t seem to be in the slightest bit bothered! Once he’s finished painting he just walks away and forgets about it. He’s not worried about where it’s going to hang or whether I like it or not, he just enjoys the process and let’s it go when he’s done. 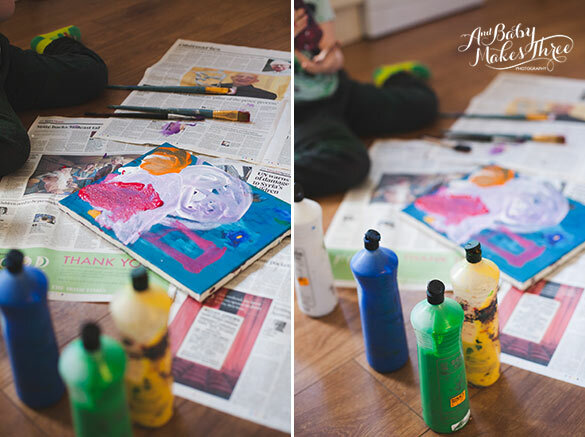 When we were recently down in Brittas Bay in Co. Wicklow we spent a morning painting shells. 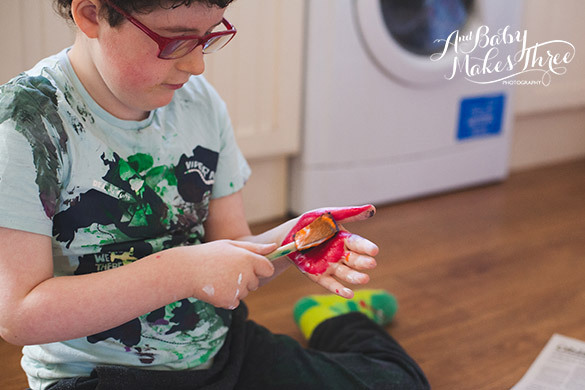 He was there painting in his carefree manner creating lovely little pieces of shell art as I was still contemplating what colours I wanted to use, or what sort of design I want to do, blah, blah, blah….when I eventually just asked him to help me and show me how to do it. He responded to my request by instantly stopping what he was doing and saying “Ok Mommy. Here’s what you do” and he patiently went on to show me step by step how to do what he was doing. Something did rub off on me and for the next hour or so I did manage to let myself go and I was happy with what I came up with. They weren’t as good as Oisin’s but they were so much freer than what I had been creating earlier. I guess I’m hoping that by watching and observing him as he creates it will somehow miraculously rub off on me. So watch this space! 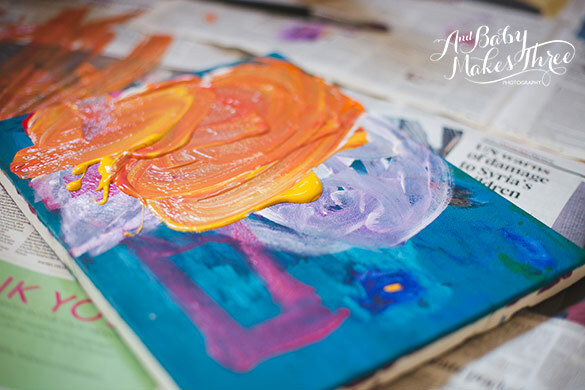 I’ll keep you updated and you’d never know I may one day share a beautiful large colourful canvas here on the blog that will bring joy & happiness to the world. 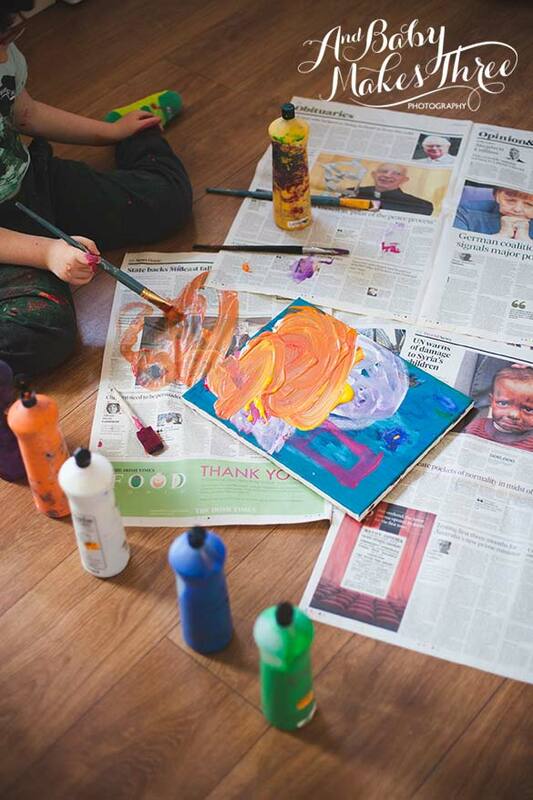 Have a creative weekend and don’t forget to turn to the little people in your life for some lessons in creativity. By the way, if you’ve never seen this video by Sir Ken Robinson on children, schools and creativity, I urge you to watch it. No matter how many times I watch it, it still manages to make me laugh and cry a little. Enjoy! 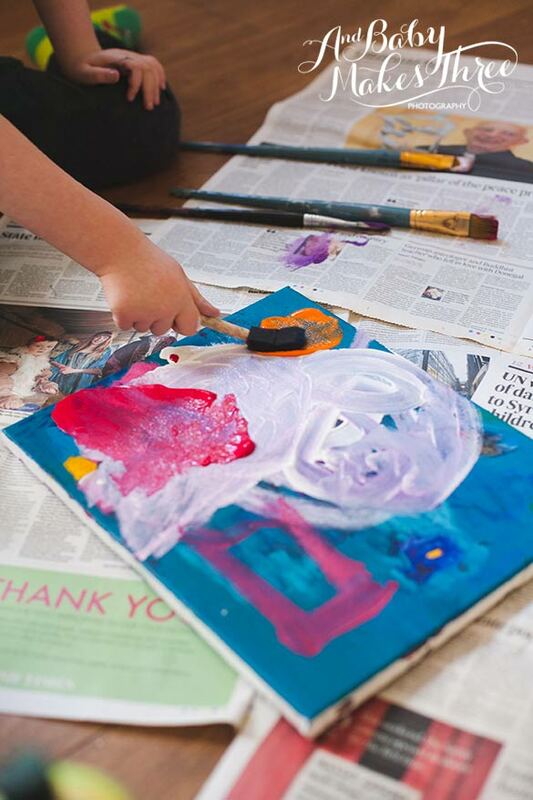 Well now, I love this… I love your little artist…both the one being expressed by your son and the one feeling left out in you. I love how much it would mean to her to be free. This is good. I hear your frustration and I also hear your desire… not to be perfect, but to be free. I can’t wait to get together with you to explore, to get down and dirty, to create… to be freeeeee!